TNUSRB Sub Inspector Govt Job 2019 Syllabus Check Here. TNUSRB Notification is out. 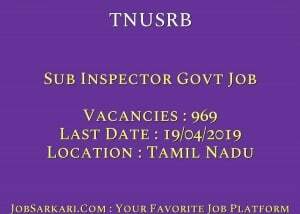 TNUSRB is recruiting for 969 Sub Inspector Govt Job Posts. You can check TNUSRB - Tamil Nadu Uniformed Services Recruitment Board last date, download TNUSRB notification, visit TNUSRB official website and check other TNUSRB Vacancy details.Complete Vacancy and recruitment Details about 969 Sub Inspector Govt Job vacancies in TNUSRB are provided below by JobSarkari.Com only for you. Last Date for Apply Online 19/04/2019. For All Candidate Rs.500/-(Candidate Applying For Both Quota have to Pay Rs.1000/-). Mode of Payment Application Fee Can be Submitted Through Net Banking, Debit Card And Credit Card or Through E Challan. Sub Inspector of Police (TK). 462. 198. 309. Sub Inspector of Police (AR). 193. 83. 276. Sub Inspector of Police (TSP). 33. 00. 33. Total Vacancy. 688. 281. 969. Candidate Must Have Passed Bachelor Degree or Diploma in Related Field And Having Tamil As a Subject in Class 10th And 12th As Mentioned in Notification. Maximum Age for UR 28 Years. Maximum Age for Destitute Widow 35 Years. OC, BC, BC(M), MBC/DNC 163 cms. 154 cms. 80 cms Minimum 05 cms Expansion. SC, SC(A) and ST 160 cms. 152 cms. 80 cms Minimum 05 cms Expansion. 1. Online Computer Based Test / Written Examination. 2. Physical Measurement Test/ Physical Efficiency Test. 3. Candidates are Required to Fill their E Mail ID And System Will send the OTP on Your E Mail Address. 4. Candidates are Required to Fill All Basic Details And Have to Upload Latest Photo And Signature As Prescribed Size And Format. 5. After Successful Registration Candidate can Log In with Registration No. and Password for Payment of Application Fee. 7. Online Application Can be Submitted On or Before 19th April 2019. Q. What is the Last Date For TNUSRB Sub Inspector Govt Job Vacancy ? A. 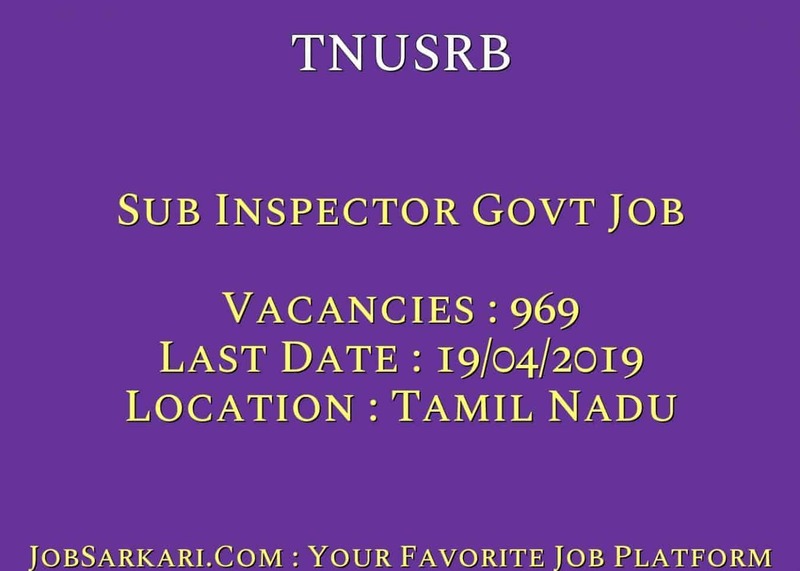 Last Date for TNUSRB Sub Inspector Govt Job Posts is 19/04/2019. Q. What is the Form Type of TNUSRB Sub Inspector Govt Job Recruitment ? A. The Form Type for TNUSRB Sub Inspector Govt Job Posts is Online. Q. How many vacancies are available in Tamil Nadu Uniformed Services Recruitment Board Sub Inspector Govt Job Posts ? A. There are about 1000 Vacancies in Tamil Nadu Uniformed Services Recruitment Board Sub Inspector Govt Job Posts. Q. What is the Full Form of TNUSRB ? A. Full Form of TNUSRB is Tamil Nadu Uniformed Services Recruitment Board .